This entry was posted in Gadgeteering, Unhappy Media and tagged facebook, google, iphone, ralph waldo emerson, self-reliance. Bookmark the permalink. Except that we live longer, healthier, easier lives that those New Zealanders. People moved to farms to avoid the uncertainty of hunting. They moved to factories to avoid the backbreaking nonstop work of farming. They moved to office to avoid the monotony and mindlessness of factory work. 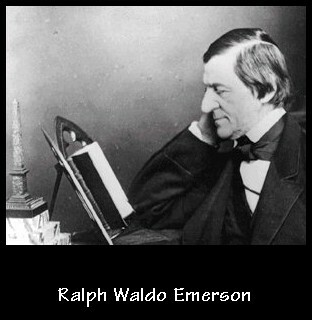 Emerson was extolling the virtues of a life he never led but rather actively avoided. How nice that he was able to spend his life writing rather than dying, 25 years old around a flock of sheep on some barren mountainside. Yet, Palvar, nowhere in Self-Reliance did Emerson exclaim “Jump from your coaches, throw down your timepieces, return to the land!” Rather, he underscored that no matter how time and technology change the societal landscape, the one thing that remains constant — and the one thing to which we must each remain principally devoted — is the self, our selves. When we surrender our knowledge to outside sources, our perceptions to the eyes of some authority, our actions to the rule of commonality, we risk losing touch with our innate abilities and rendering ourselves wholly dependent on forces beyond our control. Further, we bestow upon those forces — be they religious, be they downloadable — a degree of power over our lives that only we, as individuals and drivers of our own fates, should to have. Or, to put it non-poetically, if you can’t remember how you got something done before there was an app for that, you’re weaker than you used to be. However, by raising the “noble savage” up as some perfect state, Emerson discounts the benefits that he himself has access to. We have always been completely dependent on forces beyond our control – the New Zealander no less so than the American. He is writing at a time when the sum of human knowledge was growing at a tremendous rate, but with the amount of time given to an aristocrat, seemed to be comprehensible by one person. How is this applicable today? How can one attempt to become an expert in one’s chosen field while evaluating their governments latest longer-than-the-bible bill and what new medical advancements of which one can avail themselves? How can one not surrender some decisions to the influence of others? Turned on its head, isn’t surrendering ones decision-making to others precisely the basis for our government? I don’t agree that we have always been “completely dependent” on forces beyond our control. Dependent on, sure, even sometimes enslaved by, but neither completely. There need be a distinction between existing symbiotically and relinquishing control/responsibility. By virtue of living in a collaborative society (ie not as hermits) we are beholden to third parties to enrich our understanding and experience. And I’m not vilifying that paradigm, nor do I think Emerson was. What’s problematic is the tendency to forsake our innate capabilities when presented with a “technological” alternative. For a concrete example, take this excerpt from above: “His note-books impair his memory.” Tell me right now, Palvar, how many phone numbers can you recall off the top of your head? If your cell died and you couldn’t get to a computer to send an email, and you had to, gulp, use a payphone, I imagine you’d feel a sense of impotence. But back in high school you knew all of your friends’ numbers by heart, didn’t you? Just sayin. P.S. “Hank”? Nice. Two points for Palvar. It’s wonderful. I mean, you know they just watch movies all day. Yeah, and gradually you get old and die. You know it’s important to make a little effort once in a while.